Amblyopia, commonly called a lazy eye, is an ocular condition where sight in one eye develops poorly and does not immediately improve with spectacle correction. It is often without symptoms as the other eye functions perfectly well. It can be caused by the need for spectacles in one eye only, or a large difference in levels of spectacle prescription, meaning it often doesn’t have physical signs for parents to spot. It is also caused by a squint (strabismus). Other forms can be caused by trauma, cataract or entirely neurological reasons. It is possible, but rare, to have two lazy eyes. 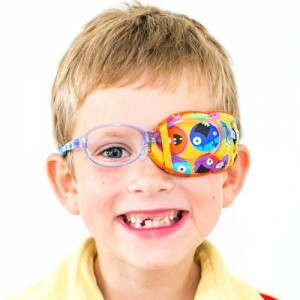 Amblyopia can be treated with spectacles and/or patching. Patching works by covering the good eye and forcing the brain to use the lazy eye more and therefore develops a stronger visual resolution. It is the under use of the eye which caused the amblyopia in the first place. Glasses, if required otherwise, are always used during patching. Whilst wearing the patch it is best for children to be doing detailed activities, if old enough then word searches or mazes are good activities, as are reading, drawing or playing with small toys. If sight is very poor then play with big bright toys will aid visual development. The amount of patching requires varies from patient to patient and is based on factors such as how long the eye has been lazy for and how old the child is. The success of amblyopia therapy varies depending on age and other factors. Regular follow up appointments (usually every 6-12 weeks) are required to monitor progress and develop an ongoing treatment plan to suit the needs of your child. Neurological resistance to treatment may require referral to a hospital eye department. Lazy eyes do not recover on their own. If left untreated they may result in permanently damaged sight which cannot be corrected when the child is older.